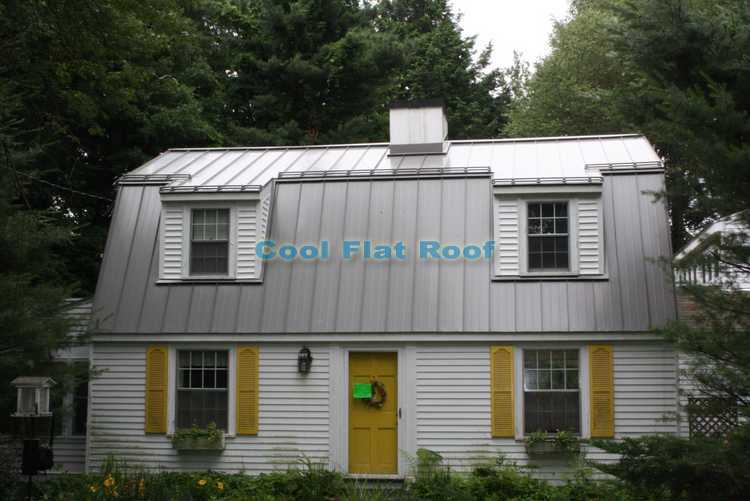 Recently we finished installing an aluminum standing seam metal on a residential home in Wayland, Massachusetts. The roof is made of .032 Aluminum, coated with grey finish Kynar 500 coating. 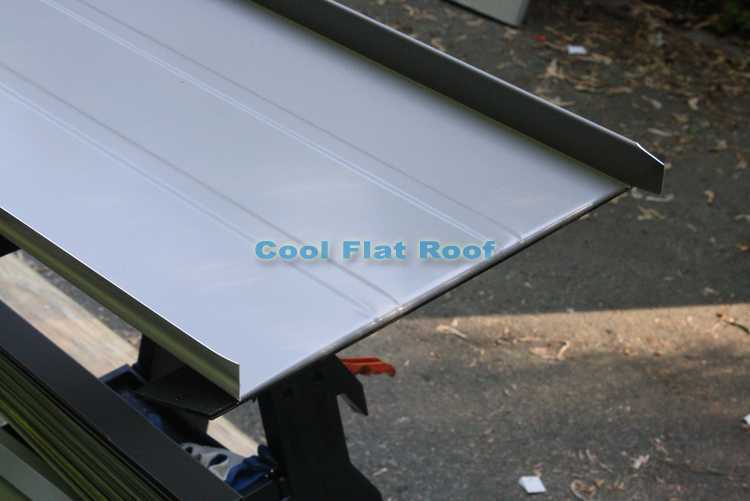 It is a 1.5″ snap-lock standing seam, attached with stainless steel clips and wood screws. Also, as you can see, there is a rail snow retention system, which I will describe in detail below. It consists of cast-aluminum mounts attached to ribs of the standing seam roof and two rows of stainless steel cross bars (rails) to hold snow and ice from sliding off the roof. Originally, the homeowner was having bad problems with Ice dams and leaks. 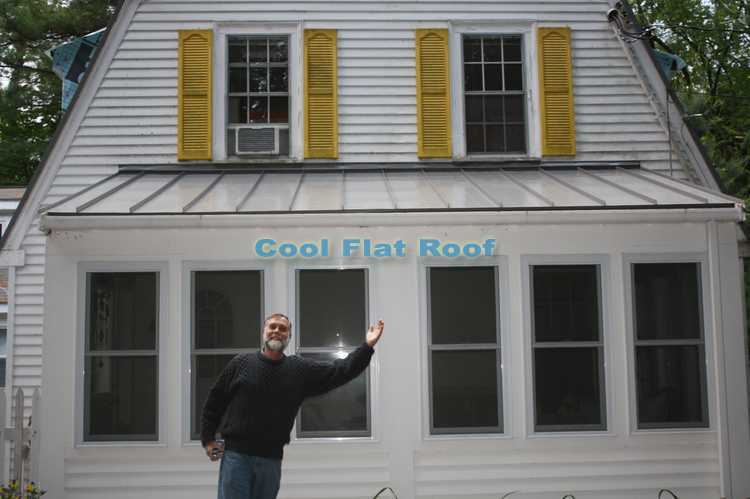 Originally, the roof had an “ice belt” made of copper, but it only covered the bottom 2 feet of the roof and as we discovered later, during tear-off, it was tucked under the shingles above it by only 2-3 inches. Needles to say, this copper ice-belt did not work as it was intended to, and the ice dams were still creating leaks. After a while, to solve the Ice Dams problem the homeowner installed large sheets of aluminum. These were new and improved ice belt sheets, and Ice dams were no longer as bad of a problem. But now, after each winter storm, snow would accumulate on the roof, and the heat from the attic (which was the original cause of Ice dams) melted the snow, which then re-froze, large pieces of Ice and Snow would avalanche off the roof, taking down the gutters with them. This was also a serious safety hazard for people living in the house and those visiting it in the winter. The homeowner,Glenn, attempted to solve this problem by attaching improvised snow guards to the sheets of aluminum, but those came down after the next snow storm, together with Ice and Snow that accumulated on the roof. After a few winters of cleaning snow off the roof after each snow storm, and fixing gutters after each winter season, Glenn was ready for a new roof. He was looking for a permanent, maintenance free roof that would be watertight, would not be affected by ice dams and a snow retention system that would prevent all the ice and snow from sliding off the upper portion of this gambler roof, and taking down the gutter system with it. Basically, functionality was the main concern for Glenn, yet good curb appeal was also important. To meet all of his requirements, a standing seam metal roofing system with energy efficient Cool Roof coating was chosen. 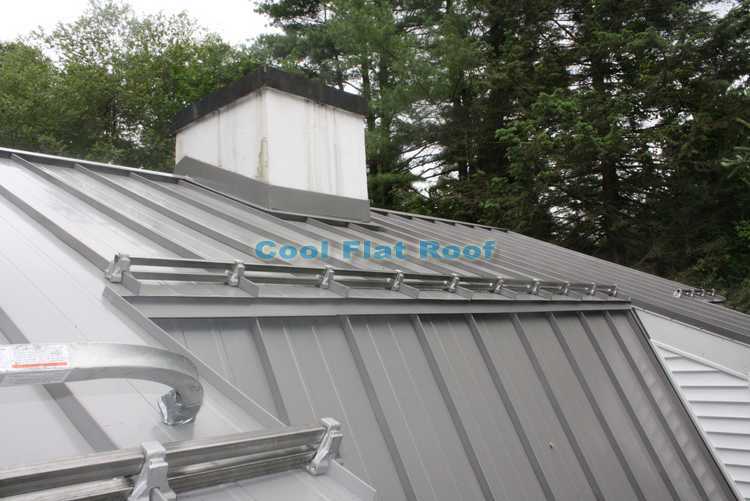 Standing seam has no horizontal seams, thus there would be no water back ups (which are a common problem related to ice dams on asphalt shingle roofs), and would just run off the roof panels. Stiffening ribs were added to roof panels for additional rigidity and to minimize oil-canning that is common to long standing seam panels. Although this roof is considered walkable and may seem easy at first, there were numerous challenges we had to overcome during the installation. 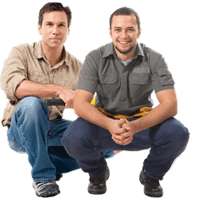 It is best to foresee these challenge beforehand, so they don’t pop-up unexpectedly during installation, cause delays, and possible change orders (those unexpected charges that many contractors bring to the homeowner in the middle of the job). Despite predicting most of those obstacles during the initial roof inspection, I still missed a few minor things, which we took care of without having to have the uncomfortable “change order” conversation. The main thing that came up during the initial inspection was the fact that we could not properly install roof to wall flashing around dormers, unless we pulled off the aluminum siding. At the same time, we could not pull off the siding without damaging it. As a result, we decided to install new vinyl siding instead of the old aluminum. 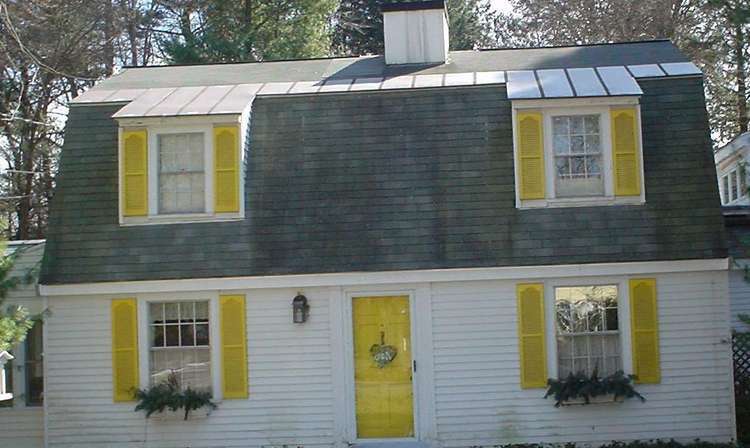 Another challenge would be the actual roof-to-wall flashing around dormers. 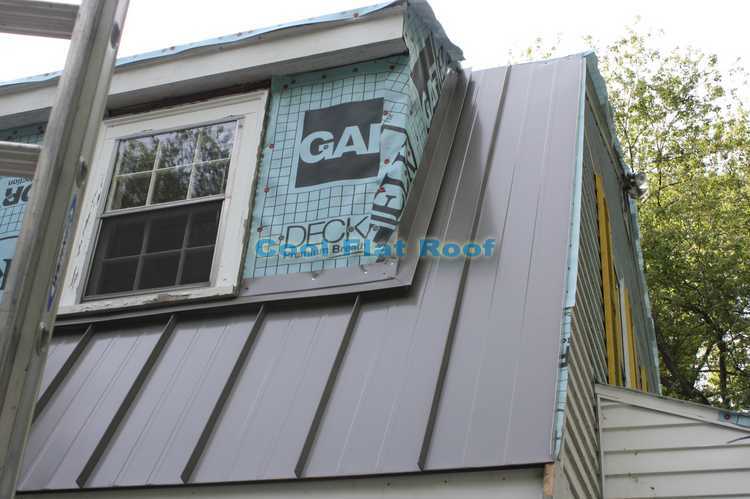 Because of a very steep slope on the lower part of the gambler roof, the bottom angle of the roof to wall flashing was almost 140 degrees, and because of added height of 1.5″ ribs, these flashings would take a very long time to be done. While we were waiting for the metal roof panels to be produced by our supplier, we had to remove old roofing shingles down to the deck. Installing a standing seam metal roof over asphalt shingles is just wrong, although some roofing contractors up in NH, ME and VT do it all the time and with steel panels too. The problem with doing this is that shingles will punch horizontal lines in the metal roof panels, making it look very unattractive. The second, and more serious problem is that granules in the asphalt shingles will rub against the underside of the metal panel, eventually scratching off the galvanic coating and causing the metal to rust in multiple places. This would not be a problem for aluminum standing seam panels, but a roofer that would install standing seam over shingles just would not use aluminum, as it is considerably more expensive for him, and extra inventory would just sit unused. Additionally, after removing the old roof down to the deck, we were able to replace any rotten wood that would otherwise have been covered over with a lifetime metal roof. Once the old asphalt shingles were removed and all rotten wood replaced, it was time for the underlayment. Underlayment is an essential part of a metal roof, and also it will protect the roof until the metal roofing panels are installed. Because those are not always available to you right away – as was the case for us, and we had to wait 2 weeks for panels to be made – the underlayment must keep the roof completely watertight until the installation is complete. Because of such serious requirements for the underlayment, we use exclusively and religiously the only underlayment that we find to be always reliable – GAF DeckArmor. It is a breathable synthetic underlayment and it is very strong, slip resistant, light-weight and makes working with it a pleasure (unlike tar paper and other synthetic underlayments). Also, a very important factor for us is the breathability. It allows the moisture trapped between the roof deck and the underlayment to pass through and run off the upper site of Deck-Armor, instead of creating rot and mold in the attic. This extends the life of a wooden roof deck considerably, and is an integral component of the metal roofs we install. Once all the prep work is done, the actual roof installation goes somewhat fast. There is a common confusion that I find among people contacting us about a metal roof. For some reason, most people think a standing seam roof is easy to install. This is actually very far from being true. Unless the roof is a straight run without any penetrations or obstacles, a standing seam roof takes the longest to install with considerable waste, if there are valleys and hips involved. Because any penetration or flashing requires cutting the panel and using a z-bar, details take double the time that it would take if we were installing an aluminum metal shingles roof. Also, unless a roof is relatively low pitch (3 or 4), it is nearly impossible to walk on panels, and putting up staging, such as roof jacks, is out of the question. Fortunately, this roof was low slope at the top, and we were able to install the bottom off of ladders – just like siding. As I mentioned in the beginning, that falling snow and ice was one of the main issues we had to address, and we had to get a heavy-duty snow retention system – the E-Rail for Berger Roofing Accessories. Once the snow guards were in place, we could finish installing the chimney flashing, remove the fall protection systems and install ridge caps. Roof installation was complete and now the Ice Dams, rain and falling snow are not a problem for this residential home in the beautiful Wayland, Massachusetts. 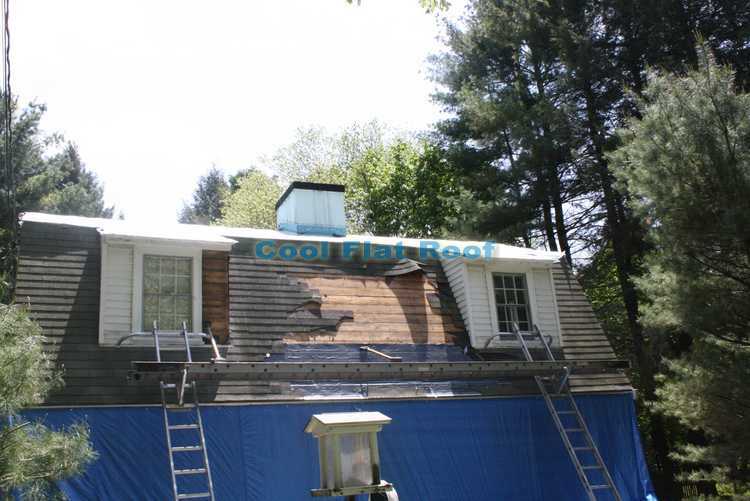 If you need a metal or low slope roof installed anywhere in Massachusetts, Rhode Island or Connecticut, feel free to call us – 617-444-9020 or fill out the free roofing quote online form, to schedule a roof inspection and estimate. You can also use our interactive roofing calculator to estimate the cost of aluminum shingles or standing seam metal roofing, and compare it to asphalt shingles, cedar shakes, slate and tile roofs. I wouldn’t consider this to be the authority on roofing. It is clear that the author doesn’t know very much about metal roofing. In fact they dont even own the equipment. That shows thier lack of commitment to this industry. The best advice is to do more research and you will see the ridiculousness of some of the things they say. 1.Are those pencil ribs in the panel? 3 Did you get any oil canning on this project? 4.Any thoughts about my 22′ lg run? 1 – those are stiffening ribs mainly we used them to prvent oil canning. 3 – I believe there is no oil canning or it’s minimal. 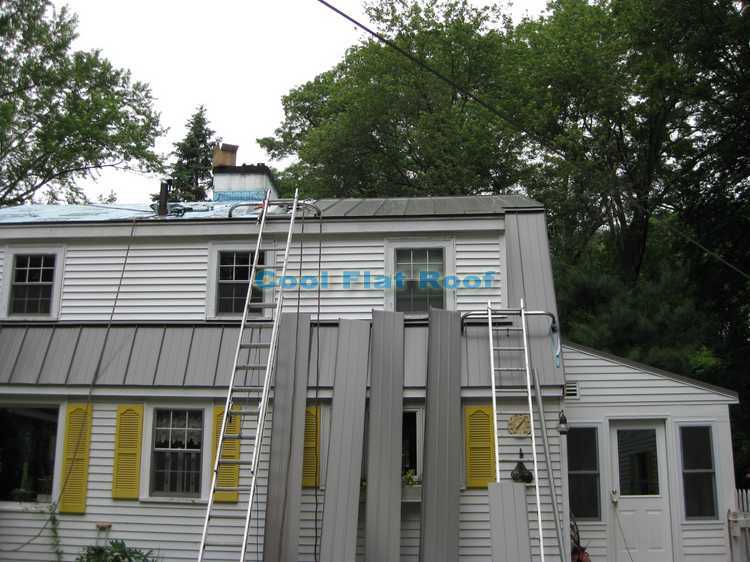 4 – 22 feet metal roof panels is nothing out of the ordinary. Don’t use the nailing strip profile as the expansion / contraction will be a problem. Use those stiffening ribs to prevent oil canning. You can use both steel and aluminum for your standing seam metal roof.